I have natural dark blonde hair but I dyed it dark reddish brown and now I want to go back blonde but when I tried to dye it blonde it went ginger and it wont go blonde because of the brown hair dye I previously put on it! Because your hair is "dyed", even if you use a lighter color, it is not going to lift it (Be Lighter). You will need to remove the darker color (ginger) first and once your hair is lighter, then you can apply the dark blonde that you desire. Because your hair will have orange tones after the color removal, you will need to use an ash dark blonde color to counter act the orange. I recommend that you have a professional colorist to do this job for best results. It is always easier to go darker, however since you are naturally dark blonde and dyed your locks to a dark brown, it is not going to lighten up that much. You should speak to a professional stylist. I usually do not recommend this because I my self color at home. At one time I did what you did. I am naturally between a dark blond and light golden brown. Closer to light golden brown. Remember you can go 2 shades lighter or darker that is for the best results. But dark brown to blonde will not achieve the look you want. 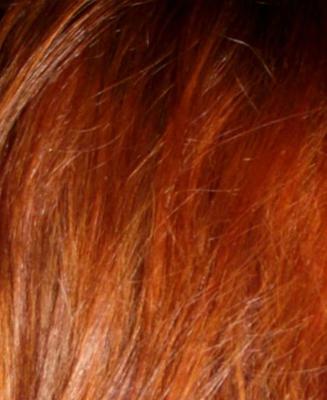 As far as it turning ginger in color, that is due to red pigments that are in your natural dark blonde hair combined with the dark brown, which will also distribute reddish pigments. This will happen unless there is an ash shade involved; But Do Not try any ash shade this will cause green or purple hair at this point. Get some regular Dawn dish soap and wash your hair a few times over about one week maybe three times wash/rinse then wash with your shampoo and do condition after wards this will fade your existing color. If you can lighten it up to at least a light brown you maybe able to recolor with a medium blonde. Remember no ash shades. Either a neutral or golden, if you do not want too much red try a neutral shade. But wait about a week or two after using the dish soap method so you do not fry your hair. I still recommend speaking to a pro though at least ask if something can be done at home. Some stylists will help that way.